At 30, The Original Mac Is Still An Archetype Of Innovation : All Tech Considered In January 1984, Apple aired one of most iconic commercials in Super Bowl history — introducing the Macintosh computer. The marketing helped position Apple as a plucky upstart, and the machine fundamentally changed the way people interacted with computers. Thirty years ago this week, Apple aired what is widely considered one of most iconic commercials in Super Bowl history. The ad boldly claimed that "1984 won't be like 1984" — the George Orwell dystopian novel — because of the imminent arrival of the Macintosh computer. The Apple Macintosh computer was introduced in an ad that ran only once, during the 1984 Super Bowl. Its "1984" ad set up Apple as the undisputed rival to IBM in the personal computer market. It created an image of a company that was fighting for individuals in the face of terrifyingly powerful corporations. Actually, at the time that commercial ran, the most popular personal computer wasn't an IBM — it was a Commodore 64. But the Mac marketing campaign created a narrative about a rivalry in personal computing: a plucky company fighting for individual creativity. It's a narrative that has helped sustain the brand. The Mac had selling points of its own. It was a computer that a middle-class family might be able to afford. Its graphics were state of the art for the time. And it fundamentally changed the way people interacted with computers: You didn't have to enter DOS prompts anymore. Using a computer became more intuitive — and it was a design that Bill Gates and Microsoft took note of. 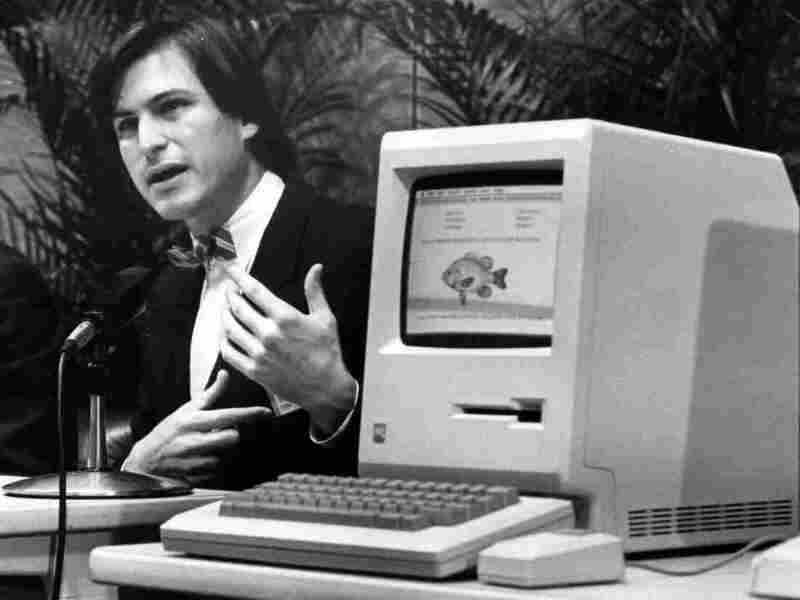 Steve Jobs introduces the Macintosh computer in January 1984. Since then, Apple has continued to innovate the way people use computing. The iPod ushered in a post-PC, mobile era; the iPhone and iPad helped merge computing and entertainment. When Steve Jobs died in 2011, the company lost its public face — and perhaps some of its swagger. Current Apple CEO Tim Cook faces constant questions about what's next and whether the company can innovate the way it has in the past. But Cook has seized upon this anniversary to articulate that the ideals that helped build the Mac are alive and well at Apple today. "We don't want to linger too long and look back at the things that we've done — we want to see what's around the next corner," he said. The world may be a bit impatient.